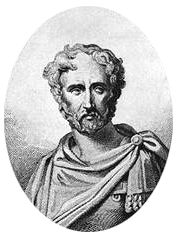 Pliny the Elder: an imaginative 19t-century portrait. No contemporary depiction o Pliny is kent tae survive. Gaius Plinius Secundus (AD 23 – August 25, AD 79), better kent as Pliny the Elder, wis a Roman author, naituralist, an naitural filosopher, as well as naval an army commander o the early Roman Empire, an personal friend o the emperor Vespasian. This page wis last eeditit on 29 Mairch 2017, at 18:19.